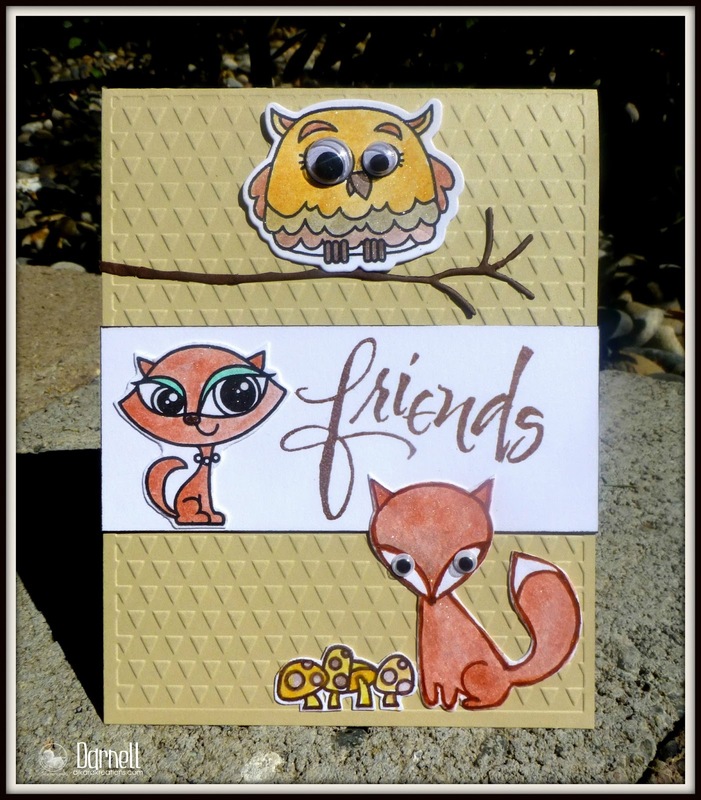 djkardkreations: Friends on World Card Making Day! Friends on World Card Making Day! Hi there! Happy World Card Making Day! In spite of phones and texting and Face Plant and Twiddle and so many people thinking they don't have time to bother with sending cards in the mail any more, cards are a maxibazillion dollar industry. For those of us who make our own cards, we have Our Own Day!! The embossing folder is "Linear" by Lifestyle Crafts. The owl and female fox are ... wait. Hold up. Honestly, people, I thought that female critter was a fox. Hammy looked through all my critters (and there are a lot of them) and told me it was a female fox. But now that I am typing this, I'm not so sure. Is that a cat? Seriously, is it? Because, darn it, I was going to enter a challenge that calls for "Forest Friends." Sigh. But, wait, there are feral cats, right? Okay, you convinced me. So as I was saying the owl and the (muffled) and the toadstools are from Paper Smooches and the male fox is from Papertrey Ink. The friends sediment from My Sentiments Exactly is copper-embossed. The branch is from Memory Box. The googlie eyes are from my googlie-eye stash. The critters are watercolored using my watercolor pencils. 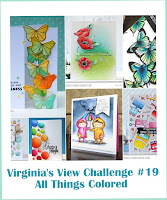 Virginia's View Challenge: All Things Colored. Could I be any happier embracing my bloggie friends in front of the Playhouse?! A lot of you have already seen two of these talented bloggie friends gracing the pages of my blog before. They are Harriet on my right and Kim on my left. And on Kim's other side I'm squeezing none other than the fabulous Greta! On Thursday we were all delighted to meet each other live and in person! Greta is from Oregon and she is just as charming and fun-loving as I imagined she would be from her wonderful blog, GG Creations. If you don't know these three ladies, you are missing out on a lot of mega-talent and inspiration! Greta's sister Laurie lives nearby and she also joined us. She kindly took the photos for us. Thank you, Laurie! It was a pleasure to meet her, as well! I think everyone also knows how much I love cinnamon rolls, right? Well, sweet Kim made and brought us all cinnamon rolls to have with our coffee AND she made another pan just for the Mister and me! What a friend to have, right?! Thank the Lord for elastic waistbands and PALEEESE do NOT tell the Mister about this pan of rolls! He'll never know and anyways, I've only got his best interest at heart because he's pretty much confined to the bed, so this much decadence would not be good for him. Cough. My sisters are going to be so drooling when they see this! And, yes, they are that good! Greta brought us gorgeous handmade frames which she made by foiling and die-cutting fun foam and I wanted to show you mine. Isn't it pretty? You'll see other examples of this awesome idea in several recent posts on her blog! This post is running long, so I will be back to introductions in my next post. As always, thank you for coming by to visit the Playhouse and special thanks to you if you take the time to join as a follower! Please let me know you came by, so I can be sure and return the flavor when the Mister is up and running again. I'm happy to say we've been drama-free the rest of this week and his leg is slowly improving! Gorgeous critters, feral or not, and wonderful sparkle and shine. Fabulous card Darnell, and so glad to see you had some fun with friends!! Loving the card. Think it is a female cat, but she could still be friends with the owl and fox. Mmmm the wild (cant remember how to spell that other word) cat certainly fits the bill. All boxes ticked. Great card, love that copper embossing. How wonderful having a get together with a great bunch of friends. And cinnamon scrolls, ohhhhhh Ihate you. No not really, glad you all had a great time. And Ipromise I wont send the Mister an email informing him of your secret. Beautiful crafting friend reunion, you are very sweet toghether! Adorable card!! Happy cardmaking day!! I'd say it's a cat for sure Darnell...especially with those beautiful big, green eyes. Not sure if she's feral...she looks like she's wearing a pearl collar! Such a fun card - lucky you meeting up with all your bloggy friends again - so jealous of those cinnamon rolls! Great photos of your blog friends looks like you were having such a good time too. Now you have made my mouth water with those cinnamon rolls. Love love love the card! LOVING those cute critters and the eyes!! And how fun to meet bloggy friends!!!!!!!!!!!!! So thrilled for you, Darnell, to have been able to enjoy the company of your bloggy friends AND that you were gifted with some dee-lish-ous looking cinnamon rolls. Your card is so fun! Feral cats...yep that is a thing and I'm sure they live in the forest. :) I adore your spirit, Ms. Darnell! Thanks for sharing! Cute card with the two foxes:) How fun to meet with friends. I love cinnamon rolls, too, and I promise not to let the Mister know that there is an extra pan laying around your house! Great forest friend card, Darnell - and for today, I think the image in question is clearly a fox! What a sweet treat to have a visit from some card-making friends and a pan of cinnamon rolls, to boot. Life is sweet. Very adorable critter card! Hope you get to make a card or two on the special day for card makers! Those cinnamon rolls look delish! 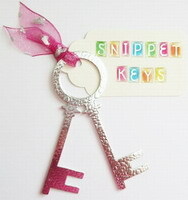 And how fun the share them with some crafty friends! What fun! A great card, great friends and great cinnamon rolls. What could be better! (My Mister has been bed bound after ankle surgery 3 weeks ago too) Anyway, thanks for playing along at The Card Concept!! Such a lovely way to spend World Card Making day OR any ol' time~~3 friends visit! 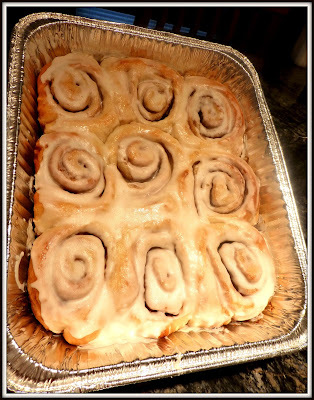 The frame is pretty and those Cinnamon Rolls look too darn good :-p Is Kim sharing the recipe? What a great picture of all of you blogger friends. Looks like so much fun. Great card for World card making day. Glad to hear that there has been some improvement in the Mister's leg. Hugs to you. A lovely card - I make and send so many birthday, Christmas and 'just because' cards and love enjoy receiving them too! Great photos - sounds like you all had a good time. Aren't young foxes called 'kits'? She' s just a cute baby! Love that owl with the googly eyes too. Fabulous cards, my friend enjoy the World Card Making day with those lovelies!! Happy World Card Making Day, Darnell! Cute card and wonderful photos! You are so lucky to be able to meet this talented group! Looks like so much FUN! Happy Card Making Day. I have actually had time this year to play all afternoon and made a few cards. I think your card is adorable and so perfect for today. Who cares if the lady fox is a cat, she looks like she could persuade us to believe she is anything! Great to see this photo and that frame is just perfect. My inner crow loves all things sparkly and shiny!! What lovely shimmer your card has!!! Love that embossing, too. How fun to see the photos of you meeting your bloggy friends! 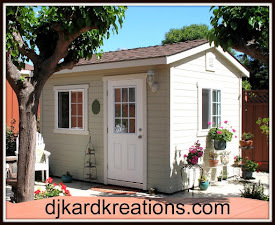 Hope you will get to meet my bloggy friend, Karen, soon!!! I love all your darling forest friends, Darnell, and your real life friends, too. I'm so glad you got a chance to get together and craft. Maybe Hammy needs glasses, but I think a feral cat works, although she's way too cute for that. Aww!! this little critters are adorable, love their googly eyes!!! Super sweet card Darnell, but I bet those cinnamon rolls are even sweeter, YUMMY, YUMMY IN MY TUMMY!!!!! I can see the shimmer on your forest friends, looks fabulous. Looks like you and your friends had a wonderful time crafting, that is awesome. Awesome little scene card. I love that and was about to try my luck at a scene card too as well to celebrate World Card Making Day! It will have to be a quick one as I am not finding much time for my card making lately. Fabulous images, I'm going with the cat and gorgeous sparkle, brilliant card. I haven't commented for a while but follow your every post. So glad you're maintaining your sense of humor and making time to spend some in the Playhouse. If there's any question about your lovely animal, I'll swear that it's definitely wild and just happened to be trying out it's Halloween costume. I do hope your Mister is also keeping a sense of humor through his ordeal. All you girls are so photogenic and I'm so envious - of that and your get-together, and the cinnamon rolls. Adorable card! Those eyes made me smile. 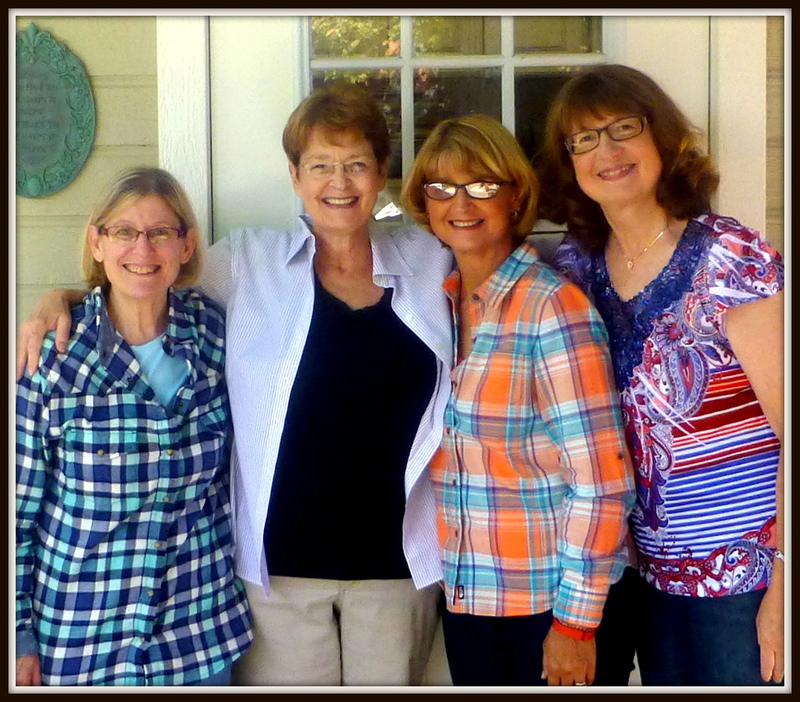 How fun having fellow stampers over! What a fabulous photo of all of you!! You lucky girls! Crafty pals AND cinnamon buns! Ah, life is great! Love your card! Yep - I'm thinking it is definitely a fox! Nice shimmer and shine to glam up the forest critters! Love that ef too! Such a cute card with those adorable images. Adorable card Darnell, and what fun to meet Greta in person. She is such a sweetheart. I bet you gals all had a ball. Still keeping good thoughts for the mister! I just love critters and especially kitties! Your card is precious! I love it! Happy World Card Making Day! LOL (or is it HA?)! Fox or cat, this is adorable and fun! And how fun to get together with so many talented friends! Hammy must have been beside himself! hello Darnell! oh my what a super fun card, adorable images and fabulous coloring! 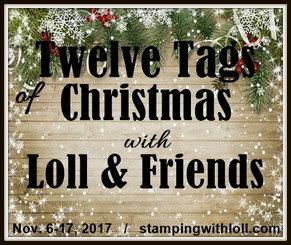 your photos with friends is AWESOME, nothing better than meeting crafty friends, oh, I guess meeting crafty friends with cinnamon rolls....*grin* so glad you played along with the Simon Says Stamp Wednesday Challenge! What a fun, adorable card!!!! It looks like a fox to me!!! Thanks for sharing it with us here at The Card Concept! And love seeing the photos! I bet y'all had a great time!!! Cute card! Glad you were able to meet with your friends...great pic of all of you! I think a cat could live in the forest. Was Wonderland a forest? The Cheshire Cat lived there right..sounds good to me! Cute card with all those happy little critters. Sure wish I could have been there with all you pretty ladies. If hubby had known there were cinnamon rolls involved, he might just have driven me cross country!! Such an adorable card! I love the little googly eyes you added to your darling little critters! 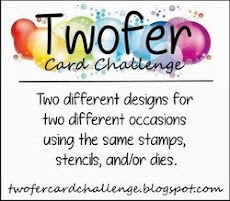 I can't believe I missed World Cardmaking Day! Spent a glorious day in London learning how to make Peking Duck, sank exhausted into my seat on the train home, opened Bloglovin on my phone and there were all these yummy posts about a party I'd lost my invitation to. However I got to eat freshly made Peking Duck and you didn't, so I win! I love, love, love your card, especially the FOXY CAT. There, I've got her into both CAT-egories. Oh how lovely to meet your friends ... Greta and I are blog friends too so I envy you meeting up!! Fabulous card there too Darnell ... And I'm making buns at the moment too! Wonderful picture of you girls so glad you were able to get together for a bit. The rolls look delicious! Your sweet critter card is adorable and to think I did t make one card yesterday :( ! Fox and friends...haha! 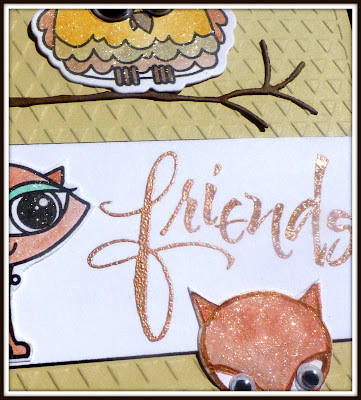 Oh Dippy, I'm in love with that gorgeous owl.........such a great fun card but you can't label that cutie pussycat as "feral", but you do have two woodland friends so I'm sure that will be enough for the challenge. Great photo of you with your blogging pals - how lovely to be able to meet up to share those gorgeous looking cinnamon rolls and crafty chatter. Love your blog and in fact have visited it quite often - so now I am a Follower - YEA. Love your narratives with your posts and of course the cards are so amazing too, great fall Friends card. PS any cinnamon rolls left??? i think that is a kitty. Whatever it is, it is so cute. What a perfect card to show along with the picture of your friends. My mouth dropped open and I screamed "that's Greta"! You have the bestest of friends and how fun to get to meet them in person. Kim's rolls made my mouth water just seeing them! Had to stop in and drool over the rolls!! Best way to enjoy the baked goods...just look at'em right? HA! What a fun card Darnell and I love the different sized googlie eyes - just perfect! You certainly look to be having fun with the bloggie friends and those cinnamon rolls look amazing. I'm so impressed that you have protected the Mister from the devastating effects of eating them. True love knows no bounds my friend! Darn! Darn! Darn!...I am so irritated I missed this confab, coffeklatsch and a chance to meet these remarkable women. Nuts! And those cinnamon rolls...ack. If you're not sharing them with the Mister, does that mean there are more for you? Hmmmmm. I'm sure you all had a lot more fun then I did this weekend. Getting back to your card, which is adorable, by the way. Love how you mix your stamp sets...and the sentiment is terrific. Hope things are progressing better in the healing department for the Mister. Think of you both often and with love. Super yummy .. that would be both today's make AND those cinnamon rolls! Will you be bringing cinnamon rolls with you in July!?!?!??!? Your card with forest animals is so sweet. I like the design and your perfect water colouring with sparkles. What a cute card! I'd say that one critter you were asking about is actually a cat, but then again I'm biased because I have a cat! It's cute, no matter what it is! Love the pictures from your gathering. I'm so glad you got to meet some blog friends! Sweet, fabulous and just beautiful Miss Darnell! Love your sweet trio of critter friends, what ever they are, so cute with the google eyes, love them. Thank you again for inviting me over on Thursday, I had a blast and so happy you and the rest of the sweet ladies loved the cinnamon rolls. As for not sharing with Mister....the way I see it, it's your waist line not his! Thanks again for being a sweet hostess! Love your friends card and the picture of all the stamping friends! So nice that you met sweet Greta! And those cinnamon rolls look mouthwatering! Mmmmm! Avery special and Beautiful card that showcases what we all treasure - friends, and even better, CARD making Friends!! You are a delight and someday I want to be in a picture with you!!! Have a BEAUTIFUL week!!! Hugs to you!!! Those rolls......OMG, I can't stop thinking about them...must email Kim to see if I can bribe her for the recipe!! What a happy lot you are and it must be so much fun to all meet in person. Oh the giggling that must go on! And the female critter, I always thought it was a cat but the more I look at it, I'm not so sure now. Its a gorgeous card anyway and I'm so in love with that embossing folder you used....tiny triangles are magical! Hi Darnell! I love the card that you created. Those critter stamps are adorable. 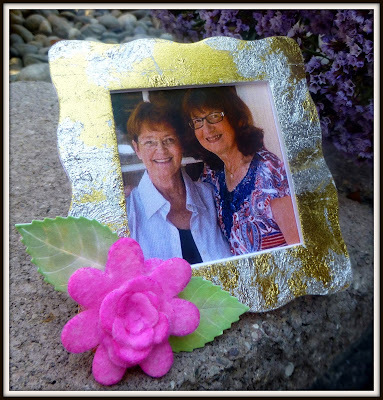 Those cinnamon rolls made my mouth water and the frame that your friend Greta made is beautiful. Have a wonderful week ahead! I love your friends card and your friends photo. Cinnamon rolls? Handmade cinnamon rolls, that girl is talented. Making cinnamon rolls would be dangerous because I would probably eat the whole tray. Elastic waistbands come with old age and I love them. Your secret is safe with me. Have a great week and hope Kevin continues to heal. I do believe the critter could be either/or a fox or kitty. I think it makes a grandiose lady fox. Love the card. Lucky you getting to meet so many crafters. Tell Kevin I said hi. Love, Hugs and Blessings to you both. I'm afraid the creature in the middle is a cat rather than a fox. And I should know haha because I'm a fox (my last name is Vos, which translates as fox in English lol) and I'm a cat lover. Of course, even foxes can be wrong sometimes. But hey, your other critters are definitely creatures of the forest and they can have all sorts of friends, right? It must be great to meet up with crafty friends, especially if they are good cooks too. Hope Kevin's leg will continue to heal steadily. my DH is still going strong. He's half way through his 3rd round of chemo and does not suffer from any serious side effects, except being very tired. I'm working hard trying to thaw my frozen shoulder and even managed tomcreate two cards on WCMD using lots of nbUS. Yay! That is an extraordinarily cute critter card! Love that coppery shine too. Wish you hadn't shown me those cinnamon rolls. Lucky that drool can be wiped from iPads... So awesome to be able to meet with your bloggy friends and have such a wonderful time sharing together!! 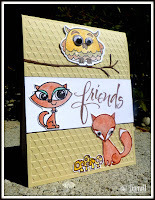 Woodland friends and bloggy friends - you got it all, including a pretty frame to capture the day for posterity. Just Precious, Darnell! Squeal!!!!!!!! !1 How did I miss this Darnell?!?! How wonderful that you got to meet Greta, I just spotted the news on her blog as I was closing the Playground down for the night before going to bed. LOVE your card too! OH, Darnell, what a FUN post! How wonderful that you got to meet Greta--and hang out with friends. Sure sounds like you'll had a wonderful visit. Love your card & all the photos you shared.